Ordered these as party favors for a bachelorette party! I was impressed with the quality of the items, the prompt delivery, as well as the nice packaging! I didn't even need to repackage the items for a nice presentation - they looked great in the decorative little boxes. Very impressed with both the product and Beau-Coup! Great party favor. Added a personalized gift tag & everything came out great! We bought this to give out to our guests that came to our wedding. It was the perfect gift because it can be very masculine and feminine. A lot of things you see on line can be very cheap, these key chains are very sturdy. I gave this as a gift with a bottle of wine to my ushers and my brother who walked me down the aisle...They loved it and it actually worked! Very cool gift! We purchased these as favors for the men in the group. They really liked it! The bar tools favor was a huge hit with the guys at a recent bachelor party. We gave them out at the beginning of the party (instead of after) and my husband (a guest) said they were finding a hundred ways to use them! Great functionality!! A very useful gift at a great price which you would never know by looking at it! Used as gifts for groomsmen and got them engraved at things remembered! Q:is it possible to get it engraved ? A:We are not able to engrave this item before shipping. Here's proof that good things come in small packages. 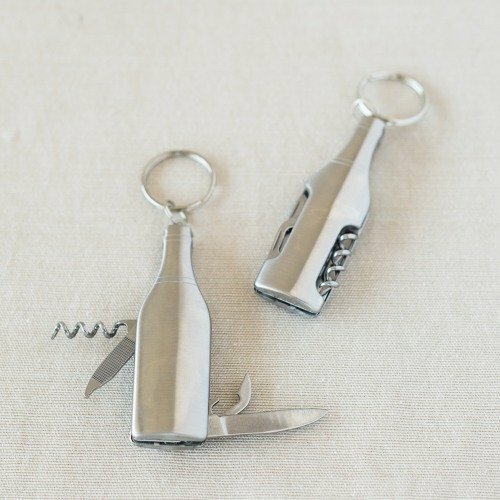 This bar tools keychain favor is a multi-purpose bar tool complete with retractable blades, corkscrew, bottle opener, metal chain and key ring–yet it's barely bigger than a key! Makes an excellent bachelor party or wedding favor.